LEH, APRIL 15: District Election Authority Leh today organised voter awareness programme here at Taru and Umla villages. 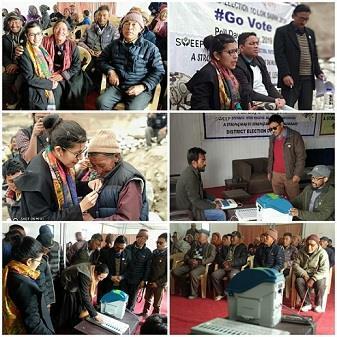 District Election Officer (DEO) Leh Avny Lavasa along with the district Systematic Voters' Education and Electoral Participation (SVEEP) team, conducted the voter awareness program. The DEO Leh spoke about the importance of people's participation in elections and distributed election badges of "My Vote Counts" among the villagers to encourage them to cast their votes on May 6. She urged the villagers to exercise their right to vote without any fear or under any influence in the upcoming Lok Sabha Elections and elect their choice of leader.